Free Inter Admissions into AP Corporate Colleges 2018, Free Inter Online Application Form, Free Junior Inter admissions in AP Corporate Colleges 2018, Inter 1st year Free admissions in AP Corporate Colleges 2018 under Corporate Education Scheme: It is a good news for SSC passes candidates. 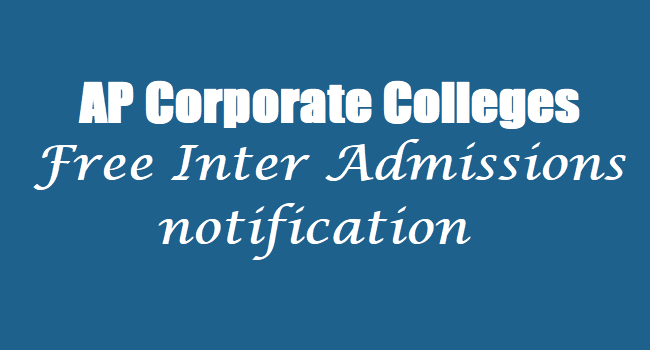 AP Government has given the Corporate Colleges Free Inter Admission notification 2018 schedule and online application forms are invited from the SC, ST, BC, EBC, disabled and Minority Students 7.0 GPA SSC 2018 Passed Candidates for admission into Inter 1st year courses in AP Corporate Colleges for the academic year 2018-2019 under corporate college education scheme. So, interested AP SSC Students can apply through online mode apepass.cgg.gov.in Web Portal and interested TS Students can apply online on telanganaepass.cgg.gov.in Web Portal. Admission into Corporate Colleges: Social Welfare Department has issued admission notification 2018 through press media for admission into corporate colleges. The Social Welfare Department invites online applications from the eligible candidates for admission into Corporate Colleges for this academic year 2018-2018 in both sates of Telangana and Andhra Pradesh. 1. The students should belongs to SC, ST, BC,EBC, disabled and minority students are eligible to admission into corporate colleges. 2. Students, who have passed Tenth Class in March 2018 and scored 7.0 GPA and above are alone eligible to apply for this notification. 3. Students of Government Social Welfare hostels, Ashram Schools, Kasturba Schools and Day-Scholars of Municipal, Zilla Parishad and Aided Schools are eligible. 4. The Officials said that students of government residential school and Jawahar navodaya vidyalaya are also eligible to apply. 5. Annual income of parents belonging to SC and ST students should not exceed Rs. 2 lakh and Rs. 1 lakh in the case of the parents belonging to BC, EBC and minority students. 10) CBSE Students has to contact the District officer for SSC Details Entry. 11) Local Status: the provisions under Articles 371-D of the Constitutions shall be followed. Eligible Corporate Colleges list should be displayed on or before 28-05-2018. Interested AP students can apply from 04-05-2018 to 12-06-2018 through online mode at https://apepass.cgg.gov.in/ web portal. Interested TS students can also apply through online mode at as per schedule. 3. Click on the Image of Corporate Admissions. 5. In this application form, fill the required information belongs to you. When will you displayed A.P selection list.And wt abt ap important dates.